Christmas shows in Branson abound from the first week of November through December 30, 2017 and one of the fascinating shows to watch during holiday season is the Miracles of Christmas at Sight and Sounds Theatre. This Christmas show features detailed costumes, state-of-the-art special effects, pyrotechnics, live animals and Christmas cheer as the story of Jesus’ birth is told. This show will remind us the true spirit of Christmas as the 300 feet wide stage is filled with beautiful lighting and scenery that reflect the time when Jesus Christ came into the world. Miracles of Christmas Show in Branson gives audiences the chance to watch in awe the birth of Jesus Christ that is brought to life right before your eyes. The show also provides audiences with an uplifting story, captivating songs, and a sense of wonder. This is a show that the whole family can truly enjoy. As you watch the show in a theatre that is brilliantly decked out in holiday attire with lights, greenery, and a thirty foot tall Christmas tree, you can feel the spirit of Christmas as you interact with a living nativity featuring live animals and actors wearing authentic costumes. Watch the story of Jesus in human form as it unfolds on the stage. The story presented in the show begins with the betrothal of Mary and Joseph in Nazareth and difficult experience follows leading up to the birth of Jesus in a manger in Bethlehem. You will know in the story how the people of Nazareth come against them and the Roman rule of Herod and his soldiers threaten to destroy their life. The play featured live animals that have been trained and housed on-site. You will see camels, horses, parrots, sheep, and more during the show. 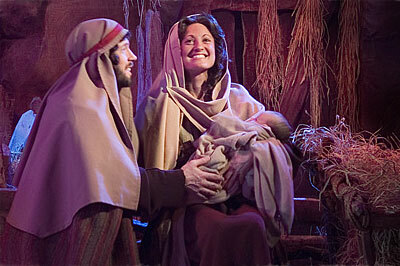 In addition, the Miracles of Christmas Show utilizes extensive cast to take you back in time of the birth of Jesus. The show experience that you will enjoy at the Sight and Sound Theatre will be enhanced by amazing visual and audio effects, beautiful costumes, and creative lighting techniques, but you can only catch the show on schedule. So come early to get the full Christmas experience in the lobby, where there will be a spirited holiday display. Listen to delightful carols, and see Lavish Victorian costumes all before finding your seat inside the theater. When you plan for your next vacation in Branson, be sure to include in your itinerary to watch the dramatic and timeless Christmas story play out with the Miracles of Christmas Show at the Sight and Sound Theatre. During the holiday season, many families visit Branson and spend great holiday vacation experience along the way. A good opportunity to give you a memorable family experience is by visiting Sight and Sound Theatres and enjoy their holiday show, The Miracles of Christmas Show. Christmas shows in Branson will take you back in time to the greatest birth of all time that gives reasons on enjoying the holiday season.